In our MIKROMAX lubrication system MDE is a system developed by us low-pressure system with a coaxial spray nozzle for fog-free refrigerant order. 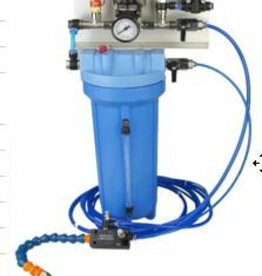 In this system, the coolant reservoir via a pressure regulating valve is at a pressure between 1.5 to 2.0 Bar. 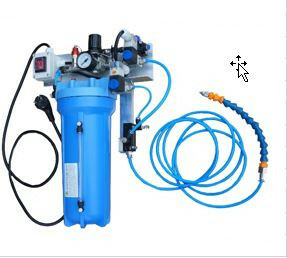 It is thereby achieved that are passed after switching on the compressed air supply of the lubricant and the blowing air with different pressures separated from each other up to the nozzle outlet, where the finest coolant droplets are forced into the air stream at the nozzle tip. The volume of the air flow at the nozzle tip and thus also the pressure can be set by an adjustable needle valve on the nozzle unit. The supply of the cooling medium is also set with a needle valve in the nozzle unit. When properly adjusted, the system works absolutely free of fog. Switching on the lubricant and compressed air is supplied with this system electrically via solenoid valves. The lubrication system can therefore be automated, ie via a single CNC control on and off. The big advantage of a droplet cooling is that the fine micro drops are so heavy that they can not spread into the surrounding air throughout the room. Another advantage is that the air flow with the embedded droplets can be targeted to the tool and the workpiece and has therefore hardly over-spray (loss of coolant). Due to the low air pressure substantially less compressed air is also required. 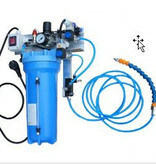 For the compressed air supply is enough a small compressor. 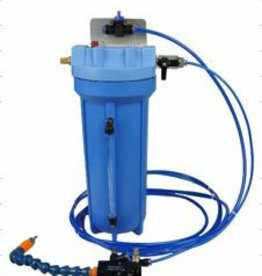 This system can be operated with all standard cooling media which are suitable for minimum quantity lubrication. Different viscosities are no problem. Our cooling system can be used on all common drilling rotary milling and sawing. It is particularly suitable for machining aluminum and for cooling on CNC controlled engraving machines. 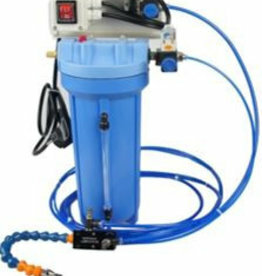 This system can be fitted on V-manifold with another nozzle. Also, a double nozzle or a nozzle for sawing lubrication can be connected.